Herbs are wonderfully plentiful in the summer. I have a backdoor herb garden with many perennial (and a few annual) herbs waiting to be snipped as I need them. Favorites are several varieties of thyme, winter savory (meaning it’s perennial, unlike its cousin, summer savory), oregano, and tarragon. 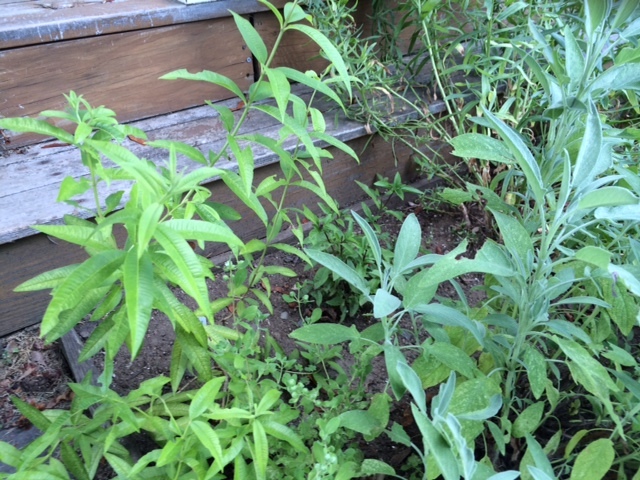 Annuals that I plant every year include rosemary, lemon verbena, and marjoram. 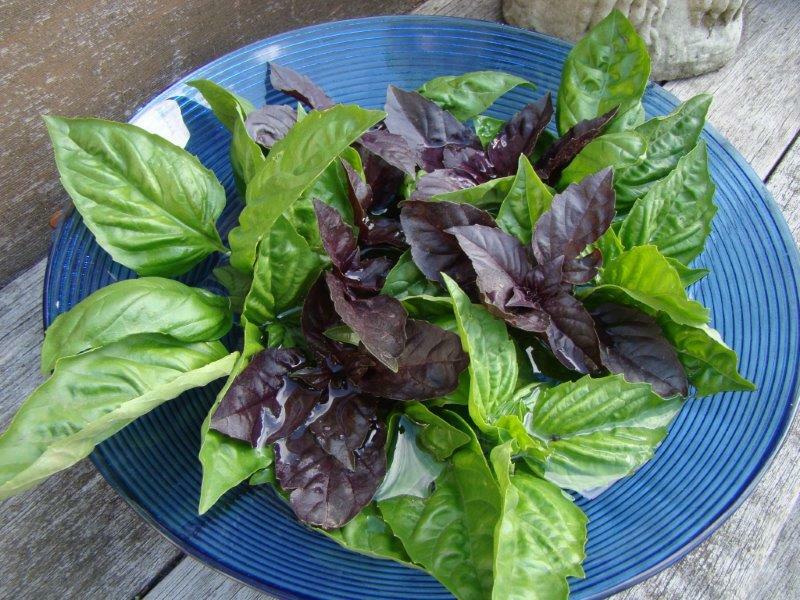 This year, I’m also trying out Thai basil. I also have a few basil plants interspersed between the cherry tomatoes in the vegetable garden. To be honest, I call it the vegetable garden, but it’s really the cherry tomato garden as that’s the only vegetable I’m growing (except for one zucchini plant in the hopes of getting some blossoms to stuff and fry). We also grew a bed of sugar snap peas earlier in the summer. So, back to the herbs. In addition to what’s growing in my backyard, as part of my farm share, I can pick handfuls of several types of annual herbs each week: basil, parsley, cilantro, and dill. Other than the basil, these aren’t ones I bother to grow at home. The quantity I use and the schedule of readiness just don’t map with practicality. I’ve had mixed results with storing fresh-cut herbs in the fridge. Even in plastic bags, with or without wrapping the stems in damp paper towels, they only last a few days before yellowing or drying up or rotting. I’ve finally settled on a method that keeps the herbs fresh for a week or more with the added bonus of providing a decorative touch to my kitchen counter. I simply treat the bouquets of herbs as I would fresh flowers, using small pitchers or jars as vases. 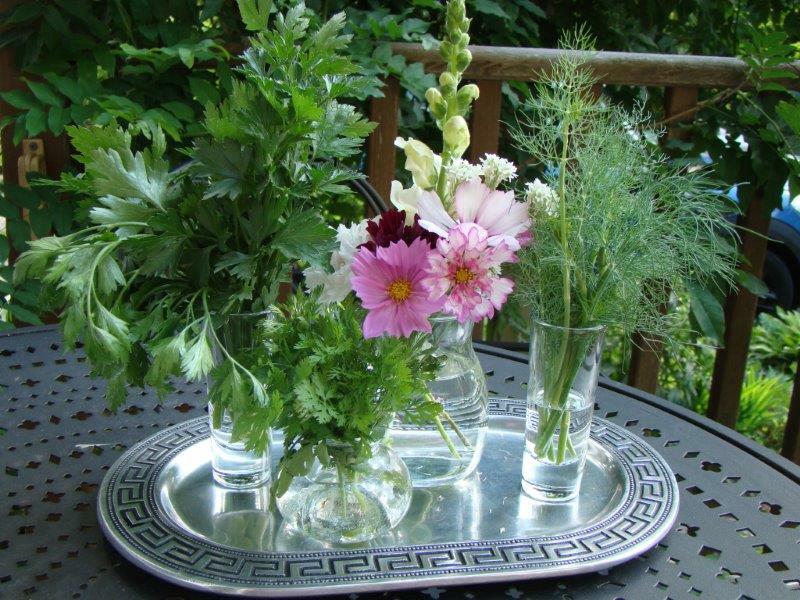 Parsley, Cilantro, and Dill surround some fresh cut flowers. In the case of basil, where sometimes, I’ve pinched the tops so there isn’t much of a stem, I float the cuttings in a bowl of water. The herbs stay green, and occasionally the basil tops will start to roots after a week. Sometimes I hesitate to use the herbs (though only for a moment) because of how pretty they look! Chimichurri, the Argentine sauce, is a wonderful way to use a variety of mixed herbs. This recipe calls for equal amounts of cilantro and parsley with smaller amounts of mint and oregano, but that is just a guide. 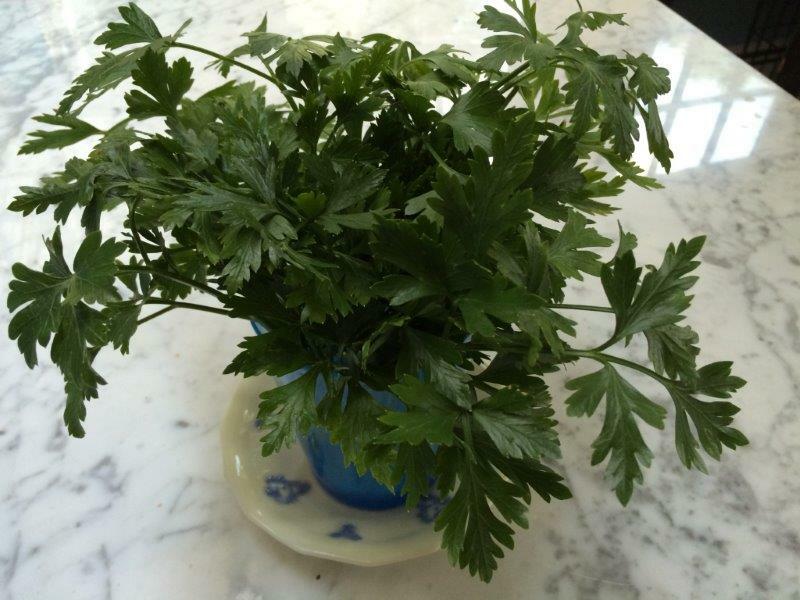 I find it best to stick with the recipe’s use of a large quantity of parsley and/or cilantro for the base and accent with your favorite herbs or the ones you have on hand. Chimichurri is delicious served on fish, chicken, steak or roasted or steamed vegetables. Sauté minced garlic in a little olive oil for a few minutes to soften. Place herbs and sautéed garlic in the food processor until roughly chopped (do not puree). Transfer to a bowl or jar. Add lemon juice and vinegar. Season with red pepper flakes, salt and pepper to taste. Stir in olive oil, and let it sit for an hour or more so flavors can blend. Store chimichurri in the refrigerator, but let it come to room temperature before using. 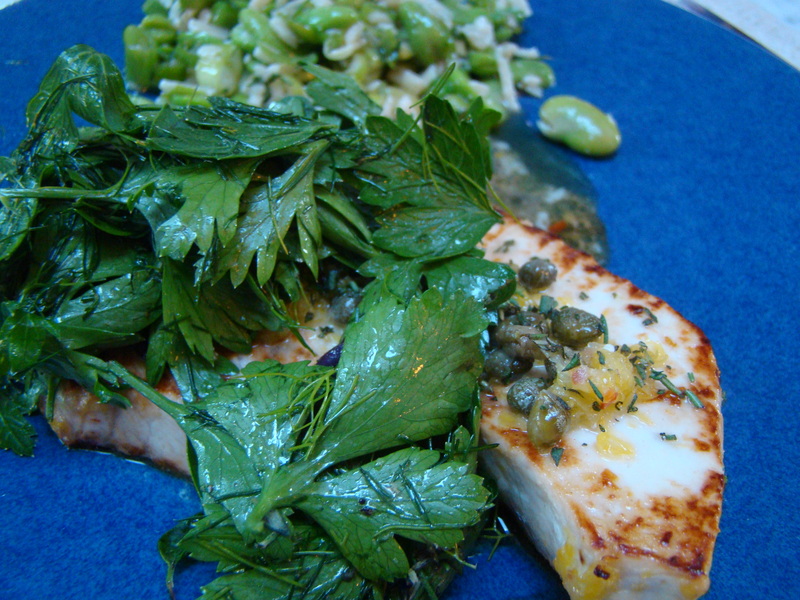 This week’s recipe for French Fridays with Dorie is Mediterranean Swordfish with Frilly Herb Salad. I do love fish, any kind of fish. Normally, fish at my house is grilled in the warm months and broiled in the cooler ones. A fishmonger is one of the vendors at our weekly farmers’ market. They had swordfish on offer, fresh from the pier that morning. In addition, a large bunch of parsley and some dill were part of my weekly CSA share at another farm. Those fresh herbs plus a few perennial herbs (thyme, oregano, savory, lemon balm) from my backyard garden rounded out what I needed to make this meal. The fish briefly sits in a lemony-capery marinade that reminded me of the sauce for chicken piccata (though I forgot to add the onion). While it soaks up the flavors for an hour, you can use some of that time to clean and destem the herbs for the accompanying salad garnish. I loved that the salad used whole leaves of the parsley and other herbs making this step quite simple. This recipe gave a grilling option, but I am not the family griller. I was in a hurry the night I prepared this dish so I following the instructions in the recipe and pan-seared the fish instead. What a pleasant surprise! This was practically fast food. 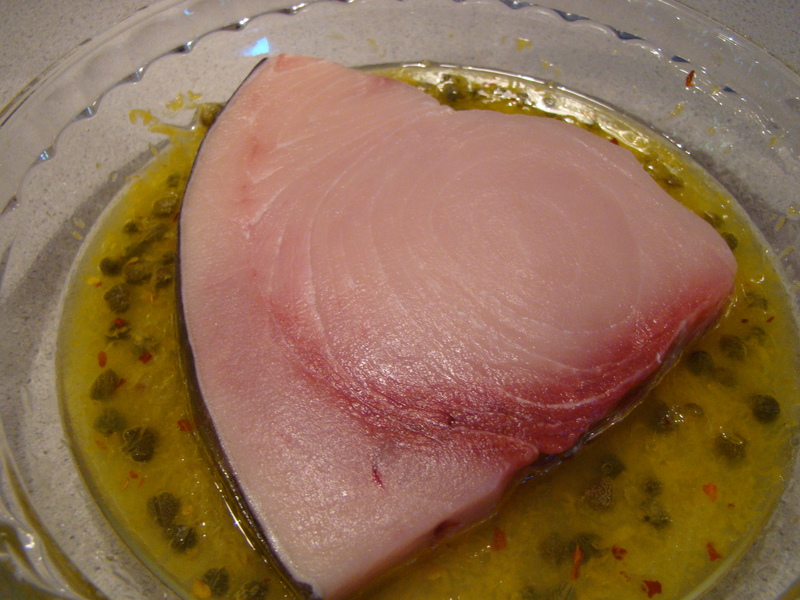 The swordfish cooked quickly and to perfection after just 5 minutes in the pan. The steaks had a lovely browned crust, and the tangy sauce (the marinade heated up) was delicious. Just before serving, the herbs are tossed with a little olive oil and lemon juice. The fish is topped with sauce, and then the herb salad, which makes an impressive plating. I made a fava bean salad to fill out the plate. More on that later this weekend. As with so many recipes in this book, I will make this one again, both as a whole and just its individual components. This new (to me) way of making fish will come in handy on a harried evening and in the winter when the grill is not an option. The herb salad is something easy made from things I always have around, especially with an herb garden just outside the kitchen door. I look forward to experimenting with different combinations. I was AWOL last week. Endless exhausting heat and (not exhausting or endless) weekend visitors proved too much of a distraction to get it together to either shop for the ingredients for this summery dessert or, having skipped it, reading my colleagues posts. 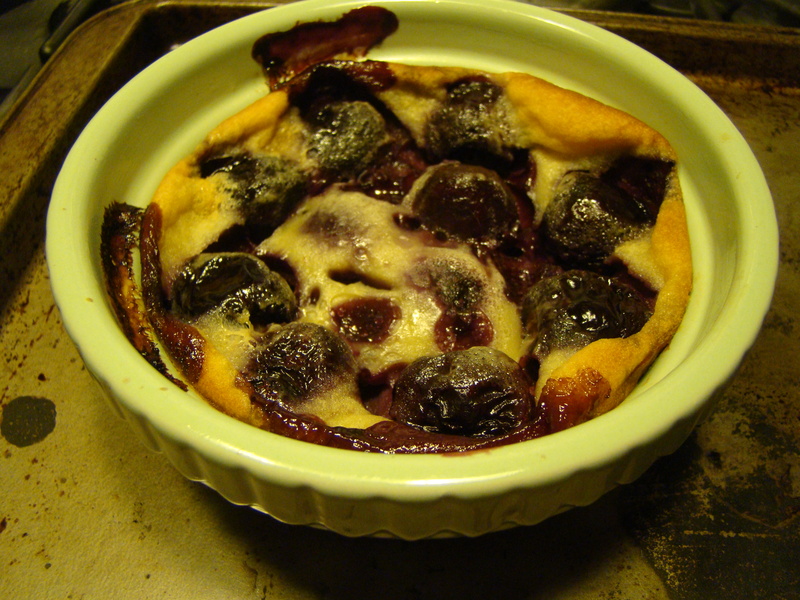 I made a third of the recipe and enjoyed two mini-clafoutis (or would that be clafoutettes) myself yesterday. I plan to catch up on posts when I check out everyone’s swordfish this weekend.